Well, at 8:17 when I went into the kitchen to check on my doughnuts, they were indeed NOT poufy and pillowy. So, I officially quit baking (again) at 8:18am this morning. But as my last official act as a wannabe baker, I decided I should at least try finishing the doughnuts to see how they came out. The dough had risen a bit, just not to double its height. I made myself some coffee and proceeded to heat the oil and drop in the dough. 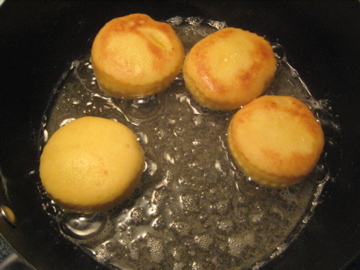 The first batch was a loss- the oil was too hot and they burned far before the inside was anywhere near cooked through. I dumped the oil and started again. The second batch was ok, but by the third batch the oil was too hot again. I sugared the second batch, ate a clementine to calm myself, and set about finishing the pastry cream. Now this was a matter of pride. I was at least going to get a nice looking picture of doughnuts. Not too bad, right? Just don’t try eating them. It’s official you have baking ADHD. i definitely have baking adhd. also, i get distracted as soon as there is any batter to be eaten. 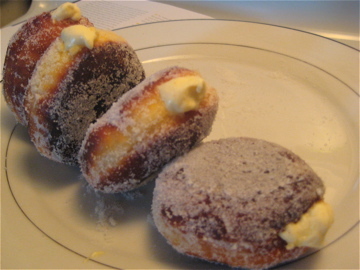 Okay, I haven’t tried to make real donuts, but I did make (fry!) some delicious apple fritters this past fall – made with fresh Michigan apples, of course. I know I am not in charge of mandations, but if I was, I would mandate that next fall we go apple picking and then make apple fritters together and watch bad tv while we eat them. Fritters are super easy and I got a nifty little scoop for Christmas (well, I got a nifty big scoop, but I exchanged it), so I can make prettier and better fritters. With you!